When you’re out and about and looking for some fun in Seoul, Hongdae is the place to be. This cool, hip neighborhood is perfect for those who want to experience the vibrant Seoul life. Hongdae is full of creativity, fun activities, good food and great shopping opportunities. It reminds me a bit of Harajuku in Tokyo. Visiting Hongdae in Seoul should definitely be on your list. There is no better way to experience the city’s vibe than taking a stroll through this awesome neighborhood. Below are the top 10 things to do in Hongdae but first let’s talk about how this district was born. Hongdae is situated right in front of Hongik University which is well known for its fine-arts program. It all started about 30 years ago when the property prices were low. Students from the Hongik University, young artists set up their ateliers around this area. The creative vibe was enough to attract even more students in the area and soon small clubs and bars started to open. The area became extremely popular among young people. Even though these days, the art ateliers were almost completely replaced by shops, clubs and pubs the creative vibe is still in the air. These awesome tourist attractions in Hongdae are perfect if you’re looking for some fun in Seoul. Check them out and find out why everyone loves Hongdae so much. Are you staying 3 days in Seoul? Read this itinerary! 1. Be a pop star for one night! Try your singing skills at Noraebangs in Hongdae! What is a Noraebang, you might ask. Well, it’s basically a singing room where you go with your friends or alone, as most Koreans do, and sing your heart out. It’s very similar to what we know as karaoke. The only difference is that you choose who you bring with you in the room! You’ll see Noraebangs all around Hongdae main street. They’re fun and quirky so you have to try them! To read more about Noraebang etiquette, check out this article. One of the best things to do in Hongdae at night is seeing the street performers. Take a stroll on Eoulmadag-ro Street in the evening or at night and enjoy the countless street performances. From dancing to live singing, there is something for everyone. You’ll see people gathering around the performers and enjoying the show. I loved the K-pop dance routines and it was amazing to see the locals singing the lyrics of the songs! The dance routines were so captivating and well thought out that I was completely mesmerized by them. The atmosphere was incredible! Note: While viewing this performances is absolutely free, you can always donate. 3. Return to childhood and play! Do you remember the times when you were a child and used to play all day long? Let’s bring those memories back and play some electronic games in Hongdae! Probably the most popular place to let your inner child out is the Zzang Games. You might already know that gaming is huge in Korea so don’t be surprised to see a bunch of locals dancing on dance pads or playing arcade games. Make sure to check out all the floors at Zzang Games as each floor is dedicated to a different set of games. I must admit that I was fascinated by this place and ended up spending way too much on games but it was fun! For just 2,000 won you can eat this tall, tasty ice cream in Hongdae. Standing “only” 32 centimeter tall, this ice cream is the queen of ice creams. I haven’t seen anything like it before. Being as big, I recommend sharing it with another person. Hongdae is the perfect place for shopping! Apart from international brands such as H&M and Bershka, there are many local shops where you can look for souvenirs, accessories and clothes. Fashion in Korea is a big thing. In Hongdae you will find artsy, unique clothing at affordable prices. Also, I would definitely choose this area to buy Korean souvenirs too. There are many handicrafts shops which are great for buying some authentic items for the loved ones back home. Are you ready to explore the nightlife in Hongdae? With tens of bars and clubs to choose from, Hongdae is the perfect place to party in Seoul. For the best experience, make sure to go during the weekend. The place to be if you are a fashionista is The Henz Club. If you’re into EDM music, you should try the M2 club. If you like hiphop, the Cream Club is the perfect place for you. There is something for everyone in Hongdae. If you’re wondering what to eat in Hongdae, you’ll find the answer here. 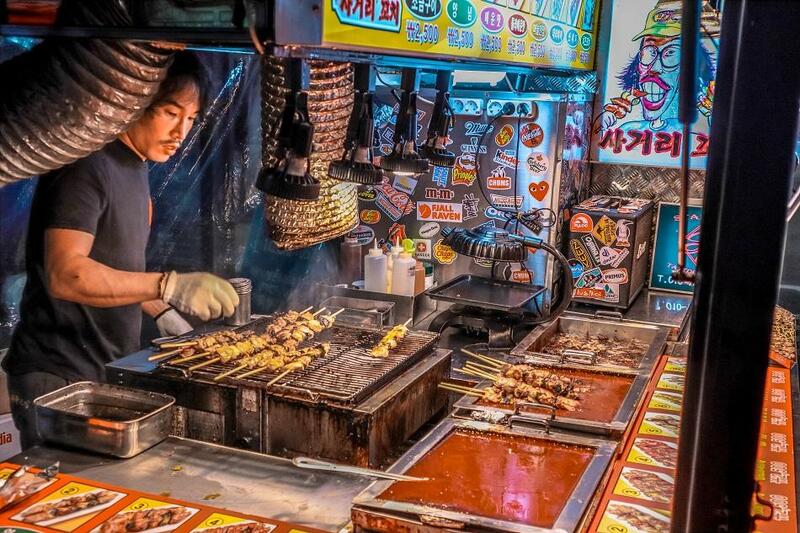 Apart from the many local and international restaurants in Hongdae, I would recommend trying the street food. It’s cheaper and more exciting! You should try the fried squid, the cheese chicken, Tteokbokki or Soondae. When passing by the street food stalls you most probably won’t know what kind of food you’re seeing but my advice is to try a bit of everything! Have a delicious coffee while petting a cute sheep. It is all possible at Thanks Nature Cafe. Making friends with animals is my favorite thing to do so visiting this cafe was an incredible experience. The two resident sheep are well taken care of and they are extremely friendly. Go say hi and play with them! Are you ready for this interactive museum where you can pose along wall art and look like you’re a part from a movie scene? Join the sea creatures, shrink down to the size of a cup or stand upside down, it’s all possible at the Trick Eye Museum in Hongdae. The optical illusions here are incredible! This cute Japanese character was created in 1974 and now it has became world-wide popular. Visit the Hello Kitty Cafe in Hongdae and get ready for some cuteness overload. Pink walls, pink carpets, pink chairs, everything is pink here. Add the cute cat with a pink ribbon and you might feel a bit overwhelmed. Try their coffee and cakes, they are absolutely delicious! I hope that these Hongdae tourist attractions will surprise you. I am sure that you will have lots of fun in this neighborhood and you will love it as much as I did. If you have any questions, let me know in the comments section below.